If you’ve ever looked into box blinds for bow hunting, you might have immediately thought, tightly enclosed space, just from there you probably know how the story goes. A deer comes in, finally presenting a great bow shot. As you maneuver to draw your bow back, it feels a bit cramped, but you think you can make it work by crouching down. As you release to let the arrow fly, you hear a loud clanging noise and feel the bow almost jump from your grip. You watch helplessly as your arrow sails off over the top of the deer you’ve been waiting for. What happened? Then you realize the bow limbs must have ricocheted off of the blind when you fired the bow, causing your arrow to fly off-course. Cue depressing music and lots of head shakes! Is this common in box blinds for bow hunting? Not always! Whether this scenario has happened to you yet or not, it doesn’t have to be your destiny. There are ways you can make box blinds work for bow hunting. It might take a little more work, but the benefits of being in a box blind far outweigh that. For example, you can sit in an enclosed blind through almost any weather, with the exception of really bad storms. If a rogue rain shower shows up, you won’t get soaked. When you want to bow hunt late season whitetails, you can stay warm inside (especially if you bring along a small heater). Your scent typically stays contained better since you’re not exposed to the wind currents. And you can also get away with more movement since you’re fully concealed. Obviously that’s useful since it ultimately helps you avoid detection longer. But it also makes a box blind a great way to introduce kids to the outdoors, since they can fidget around and stay comfortable while you wait for the action to start. Finally, elevated bow hunting blinds are generally more effective than ground blinds for archery because of increased visibility and because the steeper shot angle produces better blood trails. But there’s a big difference between rifle and bow box blinds. When you’re hunting with a firearm, you don’t need much vertical clearance, and you can get by with a pretty narrow shooting window. Bows on the other hand, need more vertical room for the limbs to flex and for your arms to extend when you draw it back. You’ll also need to position your box blind closer to where you expect deer to move when you’re bow hunting, since it requires closer shots than a firearm. So let’s jump right into the specifics when it comes to box blinds for bow hunting. 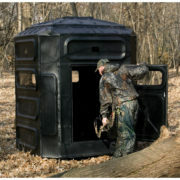 After setting up a hunting blind, positioning will be critical to make it work for a bow hunt. Ideally, the blind windows should be perpendicular to (facing the) trail you expect deer to use, which will allow you to see as deer approach from either side and offer a broadside shot. Having multiple windows is useful since you can quickly adjust if the deer moves too far one way or the other. The best location for deer hunting blinds will depend on when in the season you plan to hunt most often. Try to find a reliable travel corridor between feeding and bedding areas for the best chance of seeing a mature buck in the early season months. Bucks are still in a summer feeding pattern during this time of year and can be a little more predictable. While that location could also work throughout the season, spots near doe bedding areas may be better during the rut, since bucks will be scent-checking these spots frequently and chasing does every waking hour they have. But this approach requires strict attention to detail and discipline to pull it off (more about that below). If you’ll primarily hunt the cold late season months, food is the best place to be. At the end of the season, rut-weary bucks need to really put the calories down to build their bodies back up enough for winter. Set up a box blind for bow hunting on the edge of a standing agricultural field or food plot, and you’ll be amazed at the deer activity. For the locations discussed above to really work effectively, your box blind should be as hidden and discreet as possible. This is obviously true for all hunting stands and blinds, but it’s especially important with the solid blocky shape of an elevated hunting blind. Though deer can get used to seeing a large bulky shape in the sky, mature bucks usually don’t fully let their guard down. So if you’re hoping to connect with one of them, you should take any precaution you can by camouflaging your blind. The Vertex box blind offers a great camouflage pattern as is, and comes with 12 large side windows and 1 roof opening to offer multiple shot angles. It has 61 inches of standing room and a 48-inch square platform, which allows you plenty enough room for a kneeling or seated bow shot. Before each shot, make sure to leave several inches of clearance in front of and above or below your bow limbs to make sure you don’t contact them. This combination makes it one of the best box blinds for bow hunting. But if you want to take it a step further, add some more natural camouflage materials to hide it. Here are a few ideas if you’re wondering how to camouflage a hunting blind. First, locate your box blind among and around existing trees with lots of vertical and horizontal structure to break up the bow hunting blind outline against the background. Then use twine or zip ties to attach cut limbs and branches to the platform’s steel poles and rails. To make it look as natural as possible, step back often to see how well it blends in. While it should go without saying, use similar branches from the area so that it disappears with the surrounding vegetation. Ideally, you should attach branches all the way up to the blind, so it looks like a hedge or clump of trees. Though you can build your own wooden deer blinds and camouflage it with paint, homemade bow hunting blinds aren’t as reliable and safe as an engineered one. Make sure to get all this work done well in advance of archery season, so the deer have time to get used to the new trees that mysteriously sprouted up overnight. Going through this work will keep you more concealed in your hunting blinds but it will also hide your ladder access, which is a good segue into the next topic. Assuming you’ve followed the deer hunting strategies above, you’re off to a good start. But you can quickly throw your luck and hard work out the window if you have a poor access trail. What exactly is a bad entry and exit route and how can you tell? Well, if you can’t get to your bow hunting box stands without alerting deer in bedding or feeding areas to your presence, then you’ve already failed. With more mobile tree stand options and deer hunting ground blinds, you can easily move when the deer bust you. But with all the effort that goes into installing box blinds for bow hunting, you need to be hyper-vigilant about each detail of your hunt so you can make that location last as long as you can. Thinking of them as permanent hunting blinds switches your frame of mind, so that you’ll take better care with hunting them until the conditions are perfect. The key is to not let the deer pattern your behavior and movements. Make no mistake, if a whitetail starts to hear and smell a hunter going to the same location each morning, they will avoid that area pretty quickly. 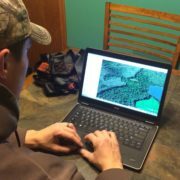 Try to plan your access trail to approach from a downwind location that doesn’t cross any major deer trails or go too close to a food plot, agricultural field, or known bedding area. Another part of hunting intelligently is to play the wind at all times. 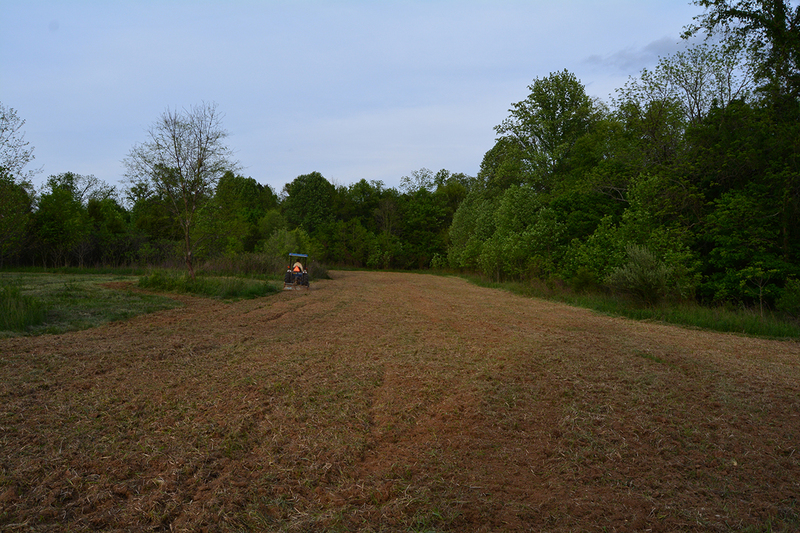 If your box blinds for bow hunting are upwind of a food plot one morning due to shifting conditions, just stay out of them. You’ll probably only spook deer, and you could make that particular box blind location useless for seeing big deer again during the season. It takes a lot of discipline to do this, but dedication is important. Whether you are looking for a box blind for bow hunting or a tree stand for bow hunting, before you purchase, you need to have clear strategies in place. For example, if you’re hunting near a bedding area, make sure you approach very early before sunrise to allow deer to filter back in when the sun comes up. Or you can approach very quietly during daylight, moving at a stalking pace for the last 100 yards. Bedding areas can be hot spots, but you need to only hunt them when the situation is right. If you’re hunting near or on a food source, however, you need to enter it only during mid-day since deer should not be feeding during those hours. But this poses a problem, since deer will enter the feeding area again in the evening, just before you need to leave. If you were to just get down, they would spot and hear you and know to avoid that area in the future. A smarter method is to use a buddy system, where a friend or family member approaches the plot after sunset with a vehicle or ATV. This bumps the deer off the field, allowing you to get down, all while not educating deer to the location of your bow box blinds. In summary, box blinds for bow hunting are really useful tools as part of an overall hunting plan. They allow you to stay warm, dry, and concealed from a deer’s senses, which means you can hunt longer and have a better chance at putting a mature buck on the ground. Using the tips listed above, you might just be successful this season. You’ve been sitting in the tree stand watching your shooting lanes for what seems like hours. Your back aches, your legs need a stretch, and you can’t feel your rear end except for the millions of pin pricks starting to work their way up your body. You stand up for a while to get some blood flowing again in the cold Midwestern firearm season weather. But after you sit down again, the shivering starts. Your body starts uncontrollably shaking, but unfortunately not because of buck fever. You can feel the warmth and life in your body draining out through the cold metal seat beneath you. It must be lunchtime (aka, an excuse to get down from the tree stand) by now, right? Thinking you can’t last much longer with your numb hands and vibrating body, you check your watch and flinch in disbelief. It’s only 9:30 in the morning! If you’ve been deer hunting long enough, you’ve probably been in this situation at least a couple times. The sheer mental boredom and physical strain of sitting absolutely still for hours takes its toll, especially when you’re uncomfortable. If you’re warm and have a comfy seat on top of one of your best tree stands, though, the time can fly by faster than you realize. And when you’re trying to put a mature buck in the back of your truck, you sometimes need to spend a lot of time in tree stands. Think about it this way: the more you enter and leave your tree stands, the more you expose yourself to a deer’s senses. You make more noise by walking over the crunchy leaves and breaking branches, you leave a scent trail that’s difficult to fully hide, and your moving silhouette is a surefire warning to any animal watching. But when you’re in a tree, you’re quiet, scent-free, and camouflaged by your tree stand blind – fully hidden from sound, smell, and sight. This is reason enough to not leave for a midday warm-up. But if you want more proof, here are a few to chew on. Deer don’t spend their entire day lying down in one place. They rest for a while, get up and stretch, browse on nearby vegetation, eat mineral soil, drink water, and wander within or between bedding areas. Many believe they move a lot during what’s called the noontime stroll. If you can place your tree stands near one of these areas, you could watch a lot of deer activity throughout the day. During the rut, all bets on buck movement are off and you could theoretically see a deer at any moment. There are just some hunting situations and locations where you need to spend all day in a ladder stand or climbing stand. There’s no getting down for lunch to go warm up at the shack or the truck in these situations. It’s just you and the cold all day, so you need to be prepared. Here are a few locations or circumstances where your hunting stands and blinds might need to adopt the waiting game. While hunting bedding areas is tricky business and has a high risk of educating deer, it’s also a great way to get close to a mature buck. For that reason, many hunters roll the dice occasionally for the opportunity to bag a buck in his bedroom. But since deer return to bedding areas in the early morning hours and will generally stay until almost nightfall, you have to be very dedicated to make this kind of tree stand location work. You’ll need to be settled into your stand at least 45 minutes before sunrise in most cases, more if you’re located close to a feeding area. You need to be quiet and fairly still from then until the sun goes down again. You could very likely see deer return in the morning hours, and they may even bed in front of you. In that case especially, being uncomfortable could kill your chances at staying still long enough to see a mature buck. Similarly, maybe you’ll be hunting a popular public land area or you hunt a small private property surrounded by neighbors with an aggressive hunting approach. In these highly pressured systems, deer are going to be very skittish and extremely discerning about every little noise, movement, or scent they encounter. When a pressured deer catches you shifting around in or getting out of your tree stands, they will quickly drop a mental waypoint and avoid that area for a while. It may not be long-term, but it could be long enough to foul up your chance of seeing them again while you’re hunting. Additionally, when you’re surrounded by other hunters, you can use that fact to your advantage. If you’re uncomfortable and cold, it’s likely that they are too. So if you can tough it out, they’ll likely get down from their stands and unknowingly chase deer right into your lap. One thing is for certain: you can’t kill a buck if you’re not there when he walks by your stand. On the practical side, some stand locations may just be too remote to feasibly leave and warm up anyway. For example, let’s say you found a promising funnel location tucked way back in the forest using aerial scouting methods. If you have to hike back into the woods over a mile, you probably won’t want to get down in the middle of the day to return to the vehicle. In these cases, it’s better to pack a lunch and stay put all day. We’ll discuss more on the food side down below, since that is a critical piece of staying comfortable. As the popular saying goes, there is no bad weather, just bad clothes and preparation. You should be able to plan for almost any conditions while in the field so that you can stay comfortable all day long. It all starts with your deer hunting tree stands. 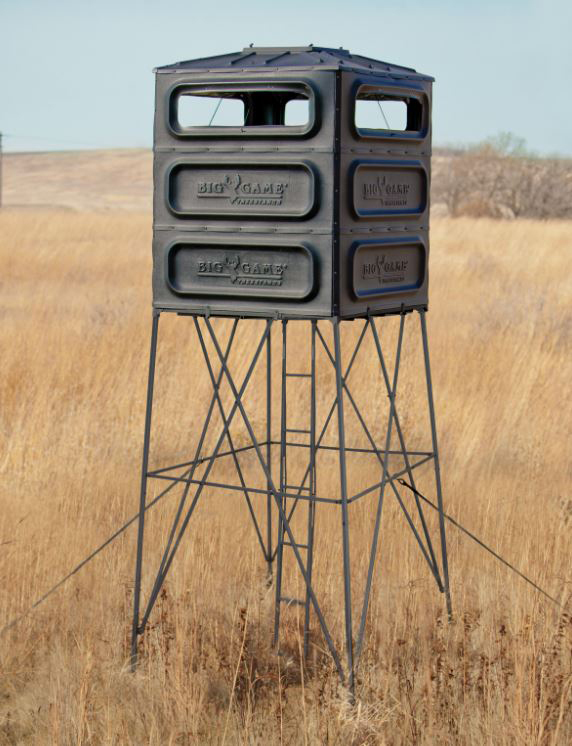 The best deer hunting tree stands should offer enough room so that you don’t feel cramped. If you feel crunched for space with no room for your hunting backpack, you’re going to feel claustrophobic within a few hours, and your legs are far more likely to fall asleep. When you don’t feel like a stand is big enough, consider buying tree stands for big men, such as two person tree stand. Obviously the most comfortable options are fully concealed box hunting blinds, where you can seal out the weather conditions and hide your presence much better. Simply lounge back on your stadium chair, and you’ll be set for a day of hunting. This amazing tree stand accessory has multiple adjustments and folds down into an easily carried bundle. Ideally, you should also have a few other critical tree stand accessories. No matter what kind of tree stands you’re in, you need to have a comfortable hunting seat to insulate your body from the cold and feel good to sit on. A portable hot seat is a great option to take with on any hunt since it is lightweight and does a great job at keeping your rear end cushioned throughout the long day. Another common issue with sitting in the woods all day is not having enough lower back support, which can quickly convince you to abandon your hunt before it’s time. The Big Game Tree Stands spring-back lumbar support provides just the right cushion where you need it, so you can stay upright and pain-free. Clothing is one of the most important tree stand accessories around. If you don’t have the right clothing, you will be miserable and won’t last long, guaranteed. It doesn’t matter if you expect hot or cold conditions; wear a base layer of merino wool or synthetic moisture-wicking material, which will keep your skin as dry as possible. Wet cotton clothing next to the skin is a recipe for hypothermia in the cold. Also, wear several insulating layers so you can adjust it throughout the day. On the morning walk into your stand, wear only your base layers so you don’t get hot and sweaty. As your body cools, add more layers gradually. If the sun comes out and the weather improves, you can always remove a layer again. The key is to stay dry by not letting your body overheat. Cold feet and hands are two of the most common reasons we might want to give up on a particularly chilly day. Avoid them by bringing high quality, insulated boots and gloves. For those situations where you need to have your hands available quickly, you can slip a hand/foot warmer into a hand muff and keep your fingers toasty without your gloves. Finally, you need to have good nutrition if you’re going to sit in the woods all day. Pack a bigger lunch and more snacks than you think you might need, focusing on high protein and high fat foods. Protein and fat fire up our metabolisms and provide a steady energy dose. Carbohydrates like candy or donuts give us a quick sugar rush, but the resulting sugar slump is not worth the short term gain. Instead, bring a whole grain sandwich of your choice, nuts, cheese, jerky, sausage, and a few pieces of fruit. Whenever you start to feel tired, cold, or even mentally bored, eat a small snack. Also, make sure to drink your usual amount of water and bring along a hot beverage in a thermos to lift your spirits when you’re getting too cold. Being comfortable in the woods isn’t like lounging on a couch. You don’t want to get so comfortable that you fall asleep and have to test out the strength of your tree stand harness. But comfort does mean being able to sit still long enough to see a buck you could shoot. Maybe that takes an hour, or maybe it doesn’t happen after a season of all-day sits. The point is that you can’t put venison in the freezer unless you put in the time to hunt. Setting your tree stands up for success means you have a far better chance than those that don’t take these steps.